(sale, Christie's, London, 14 May 1968, no. 13); (d'Offay Couper Gallery, London), January 1969; (Roy Davis, New York); gift to NGA, 2006. Turn of the Century English Watercolors and Drawings, Davis Galleries, New York, 1969, no. 48. The Pre-Raphaelite Era 1848 - 1914, Delaware Art Museum, Wilmington, 1976, no.3-16. 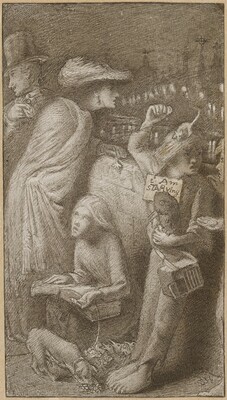 Hard Times: Social Realism in Victorian Art, Manchester City Art Gallery, Rijksmuseum Vincent Van Gogh, Amsterdam; Yale Center for British Art, New Haven, 1987 - 1988, no. 17. Dyos, H.J., and Michael Wolff. The Victorian City. 2 vols. Boston, 1973: 2:458. Reynolds, Simon. The Vision of Simeon Solomon. Stroud, 1984: no. 12. Cruise, Colin, et al. Love Revealed: Simeon Solomon and the Pre-Raphaelites. London, 2006: 33. Sell, Stacey. "Simeon Solomon, I Am Starving." National Gallery of Art Bulletin 36, (Spring 2007): 21.